Boisterously poised on the bank of the Tila river, the town of Jumla is the capital of Jumla District and the headquarter of the Karnali Zone of Nepal. This region happens to be one of the largest producers of rice grain (the unique “red rice”) in the world. Perched at an altitude of 2514 m, Jumla is the gateway to Rara Lake (2980m), a favored trekking destination in Nepal. Trekking to Jumla offers you the combo of absolute wilderness and solitude. But yes, you do have to customize yourself with the logistical limitations. The downtown is at about 10 to 15 minutes walk from the STOL airstrip. Don’t expect sophisticated accommodation and the restaurants are not catering to the plethora of cuisines you would be yearning for. Now this might narrow down your eyebrows further; the local regulations in Jumla have declared it as an alcohol free district…yes, this means…no boozing around! Well, if you set aside your comfort, you will be overwhelmed at what Jumla offers. Off the beaten tracks, profound wilderness, diverse panoramas, and multifarious culture……Jumla has them all for you! Dolpo is another far-flung and mystique gem of Nepal. Bound to the east and south by the towering Dhaulagiri and Churey ranges respectively, this secluded corner of Nepal was derestricted for international tourist access only in 1989. It’s only since then that the flavor and fragrance of modernity and development gradually began to smear up on this region, albeit trekking along some of the places in this region, you might just feel that time has been stagnant for centuries as you see the inhabitants (mainly Gurungs and Magars) still indulged in the orthodox way of life. 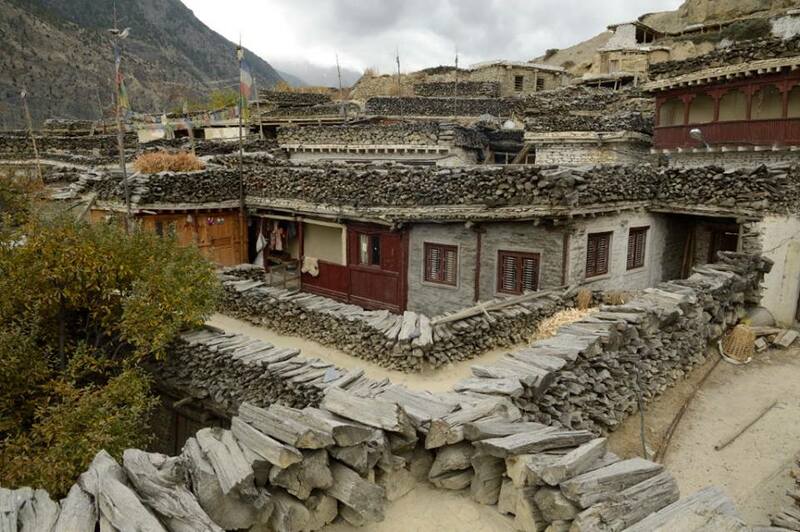 “Ba-yul”, is the local nomenclature for Dolpo, which literally means “the hidden land”. 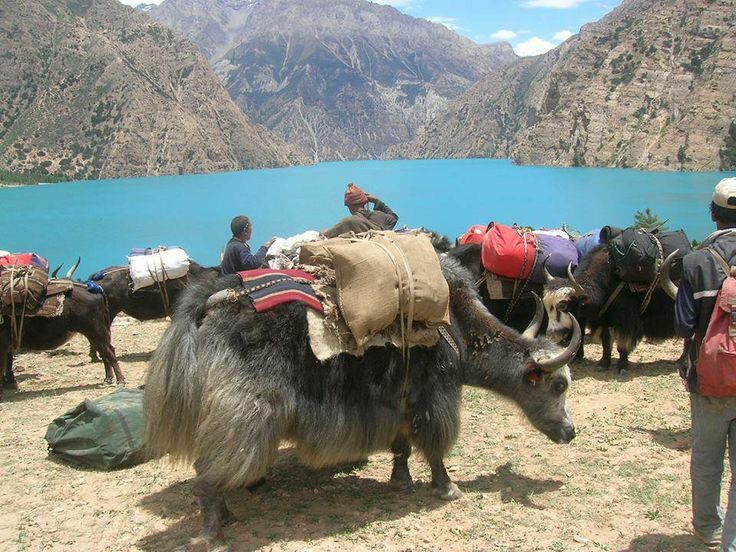 Dolpo is fortressed by the Shey Phoksundo National Park (3555 sq km), Nepal’s largest. The Tibetan style villages in Tarap, the big mountains and monasteries perched at unlikely places, the high passes (Kagmara La, Numa La, Baga La) and people’s inclination towards the “pre-Buddhist Bon Po” religion, make this place even more special and tempting. Watch out for the extensive range of floras and faunas. Carry your lucky charm with you…you might just stumble upon the legendarysnow leopards!! Hence, in a nutshell, the Jumla and Lower Dolpo Trek is sure to become a once in a lifetime experience for you, acquainting you to the flip side of Nepal, or rather a remote and pristine Nepal! After breakfast, you will be driven to the domestic wing of the Kathmandu Airport. About an hour’s flight would take you to Nepalgunj, the western region hub of Nepal, which borders the Indian state of Uttar Pradesh to the South. As we don’t have a connecting flight to Jumla, from where our trek commences, it gives us the opportunity to explore this hot and humid town. The city center, Dhamboji, happens to be the business hub with plethora of hotels and shops. Hindu as well as Muslim culture influence the town. Bageshwori temple and Muslim market are also worth visiting. Overnight at hotel in Nepalgunj; breakfast included. Flight from Kathmandu to Nepalgunj was almost tantamount to a nose dive, while, from Nepalgunj to Jumla, it’s just the vice-versa. We’ll take a 35 minutes early morning flight to Jumla. The city center is only about 15 minutes walk from the STOL airstrip. Jumla lies on the banks of the Tila River at 2514 meters. When we talk about Jumla, we remember its delicious apples. The cider made in Jumla, locally known as “Marpha” is also very popular in Nepal. Taste the apples and take a sip of the cider while you get familiar with the trekking crew. Rest well, as from tomorrow, “walk” is the name of the game! Overnight at camp in Jumla; breakfast, lunch and dinner included. The fifth day of our trip but the first day of our trek; you are excited, aren't you? Don’t let that zeal drop; it is a lengthy trip and you will need it. We commence our leggy mission along the trail that leads us past several water-driven mills before dropping to the confluence of the Tila and Chaudhabise rivers. Crossing a cantilever bridge, we make our way up alongside the terraced rice fields and arrive at the village of Dochal Ghara (2630m). The trail now takes us through the forest of maples and walnuts to a meadow. Cinquefoils, terrestrial orchids, forget-me-nots, mints, buttercups, primular, edelweiss and gentians are some of the wildflowers you will be able to spot. Leaving the meadow, we climb up a rocky cairn at Pattyata Lagna (2830 m) and then make a gentle descent towards Gothi Chaur, close to a stream at the bottom of the valley. Overnight at camp in Gothi Chaur; breakfast, lunch and dinner included. The trail junction at Gothi Chaur has two trails; one that leads uphill out of Gothi Chaur and the other leads us downstream through the forests to the series of mills at Kuri Sangta. We chose the later path and re-enter the Tila valley. Following the Tila river towards the north, we pass by the corn and potato fields and then make immediate ascent through the fields of buckwheat and barley, which gets us to the village of Munigaon. We trail ahead and arrive at Muni Sangu, another trail junction. As you shower your glances around the houses behind and above, you will notice the uniquelycarved wooden faces, known as Dokpo. These carvings are believed to protect the people of Munigaon against the evils and perils. Before moving ahead, you need to show your passport at the Muni Sangu check post. From here the trail follows the left fork (southern side) of the Tila river. It is noteworthy that the Tila river is known differently in different places. Here, it has a name of “Churta”. We pass by Changrikot and then climb to the village of Chotra (3010m), mainly inhabited by the Khampas, people from east Tibet who follow Buddhism. Moving a short distance ahead of Chotra, will get us to another Tibetan settlement of Napukhana. There is large gompa here, known as Urgen Sanga Chholing. Overnight at camp in Napukana; breakfast, lunch and dinner included. After an energizing breakfast, we resume our trek along steep trail past the rocky fields towards the forest of oak and birch trees. Crossing the Tila river (here called as “Churta”), we climb through the birch, oak and rhododendron forests until we reach Mauri Lagna (Honey Pass-3894m). The pass offers wonderful views of the snow covered mountains- Bhalu Himal (5460m) to the south, Matatumba (5767m) and Gutumba (5608m) to the to the north-east. In spring, it’s simply awesome trekking to this region as the pass is embellished with blue lilies and lively rhododendrons. In winter, as expected, the trails seem to be buried deep under the snow. Let’s descend from the pass now and head on for a lengthy walk towards the cairns of stones. It is to be noted that the region along this traverse is highly avalanche prone. We pass by few herders’ camps and take a steep descent to the forest of pine and oaks. Continuing ahead through the forest along the bumpy trail, we climb up to ridge and then steer towards Bheri valley. As we advance further, we pass by the settlement of Chaurikot. The trail now descends to a stream and again winds up to a ridge. Another 45 minutes walk from here will finally get us to Balasa. We can relish the view of Kangmara peak from here. Overnight at camp in Balasa; breakfast, lunch and dinner included. We trail down to a stream and then climb to a forest of walnut trees, our constant companion for next few hours. Walnuts are regarded as a prime source of cooking oil here. Passing by the fields of corn & potatoes and apple orchards, we arrive at the settlement of Rimi (2890 m). You will once again notice the carved wooden faces (Dokpa), staring from top of the houses; though by now, they seem much familiar. We continue our descent along the walnut woodland, pass by the settlement of Majagaon and then further make our way down the rocky trail to Bheri river. We cross a bridge over the river and then arrive at Kaigaon. Kaigaon is actually the transit to theKagmara La pass. Overnight at camp in Kaigaon; breakfast, lunch and dinner included. As we begin our trek passing by the school at Kaigaon, we follow the west back of Bheri river. We walk past the settlement of Hurikot and the Bonjo Gompa, which brings us at the threshold ofShey Phoksundo National Park. Advancing further high above the Bheri River, we arrive at the confluence where the two tributaries of Bheri River viz. Jagdula River and Garpung River merge. The trail now winds down and across the Jagdula river taking us to our campsite near the army post at Toijem. Overnight at camp in Toijem; breakfast, lunch and dinner included. On the 10th day of the Jumla and Lower Dolpo trek, the trail stretches ahead up along the west side of Garpung river to about 3650 meters. From here, we deviate to the east side of the river and then continue ascending. As we move ahead, we can notice the valley narrowing down and the river transitioning into a series of waterfalls. The trail now takes us up to the moraine at 3900. A little ahead is the Kagmara Phedi. We can camp at one of the huge boulders of Kagmara Phedi and relish the views of the peaks and some wild flowers such as blue poppies, buttercups, gentians, puffballs etc. Besides, pigeons, redstarts, ravens, griffons and blue sheep can also be spotted here. Overnight at camp in Kagmara Phedi; breakfast, lunch and dinner included. Trek from Kagmara Phedi to Lasa (4060m) via Kagmara La (5115 m) / 7 hrs of trek in total Today we will be trekking for longest time to the highest elevation of this trek. We don’t want to end up being at the campsite in the chilly darkness, so we start early. Making our way up alongside the Kagmara glacier, we begin our snowy ascent to the Kagmara La (5115 m). After about 2 hrs, we are right at the top of the pass! We can halt here a bit to catch our breath and take some snap shots of the fascinating milieu. After that short recess, we move ahead and gradually descend some 900 meters along a stream to the pastures of Pungmo valley. A gentle descent from here will eventually get us to the shepherd’s camp at Lasa. Overnight at camp in Lasa; breakfast, lunch and dinner included. We kick off the trek, walking on the route high above the Pungmo River and enter the birch, juniper and blue pine forest. As we cross the wooden bridge over the river, we can relish the distant view of the side valleys of Kanjerawala. Moving ahead, we pass by the barley fields of Pungmo village. The village also has a Bonpo Monastery and an apple orchard. We continue downstream until we arrive at the river junction at Sumduwa. Overnight in camp at the banks of Phoksumdo River in Sumduwa; breakfast, lunch and dinner included. The route from Sumduwa to Phoksumdo Lake boasts the trinity of beautiful forested sections, the unique Bonpo culture and of course, the mesmerizing splendor of the Phoksumdo Lake. Staying on the main trail, we climb through the forests of big cedars and arrive at Palam, a winter settlement used by the people of the Ringmo village. The entrance station for the Shey Phoksumdo National Park is at the south end of the village. The route takes us ahead on switchbacks to an elevation of 3300 meter. We continue along the bumpy route, this time even aggravated by the dust along the trail, and climb up to a ridge approaching a 200 meter high water fall, the highest in Nepal. Advancing further, the route takes us to Ringmo village, a picturesque settlement of flat-roofed stone houses with lots of mani walls. Making a slight descent from Ringmo, we cross a bridge and continue trailing until we arrive at the stunning milieu of Phoksumdo Lake. Overnight in camp at the national park camping ground in Phoksumdo; breakfast, lunch and dinner included." A well deserved rest day in a spectacular milieu! 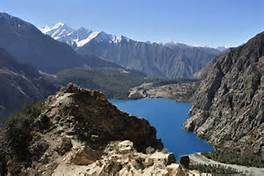 Phoksumdo lake offers some wonderful excursions to the Bon Po monasteries and Ringmo village (3733m) which take 6-7 total trekking hours. Admiring the beauty of this splendid turquoise lake is also not a bad idea. To the west of this lake, you can see the two snow clad peaks, viz. Kanjiroba and Kanchen Ruwa. Following the trail through the stand of juniper trees, will get us to and old dilapidated Bon Po monastery known as Pal Sentan Thansung Chholing. Ringmo village is a charming, medieval looking settlement of flat-roofed stone houses, carved mani walls and ancient chortens. Overnight at camp in Phoksumdo; breakfast, lunch and dinner included. That extra day at Phoksumdo lake offered us rest as well as refreshment. Following the stream originating from Phoksumdo lake, we backtrack to Ringmo village (3640m). From here the trail leads us through the forest of birch and chir pine to a ridge. We make our way ahead along the dusty and bumpy track and arrive at Palam (3397m), the winter settlement of the people of Ringmo village. From here the trail takes us down through the forest of cedars past the spectacular 200m high waterfall from Phoksumdo lake. Continuing our way along the switchbacks, we arrive at the confluence of Suli Gaad and Pungmo river. We now climb a ridge and then make a steep descent of about 900m to the nine houses of Renje. Overnight at camp in Renje; breakfast, lunch and dinner included. Ups and downs have been irritatingly frequent in the last few days and today’s trek is not going to be an exception! Following our route ahead, we make our way along the switchbacks through the forests of firs and larches alongside a river. As the trail continues downstream, it becomes a collection of rocks and sticks forming a dyke along the river bank. We continue our way ahead to a ridge and then descend along a rocky path to Chepka. There are campsites here but we walk ahead for about 20 minutes and arrive at walnut grove beside a massive boulder, where we camp overnight. Overnight at camp in Chepka; breakfast, lunch and dinner included. The area from Chepka to Juphal is well known for “Chuk”, a lotus like plant used for therapeutic purposes. Resuming our trek, we move ahead and pass through the villages of Ankhe, Rahagaon and Parela, a Nepali version for 'eye', 'eyebrow' and 'eyelash' respectively. We follow the river and continue our way down until we reach Dunai (2140m). We then zealously make the last ascent of this trek through the meadows and eventually conclude our footy mission, arriving at Juphal. Team, we’ve done it! Let’s celebrate this accomplishment with our crew members and thank one another for the amiable and supportive company throughout this long trip. Overnight at camp in Juphal; breakfast, lunch and dinner included. After breakfast, we take an early morning flight to Nepalgunj. It takes about an hour until you land on this usually torrid region of Nepal. As we do not have any connecting flight to Kathmandu, we will be halting at Nepalgunj today. With more than half of the day remaining, you would probably not want to confine yourself in the hotel room all day. Explore the city center and other prominent spots that you missed out on you stay here earlier. Overnight at hotel in Nepalgunj; breakfast included. From Nepalgunj (150m), you would almost be rocketing to the soaring elevation of Kathmandu (1400m). Another sixty minutes flight and you will touch down the domestic wing of the Kathmandu Airport. 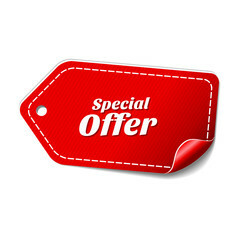 A representative from Nepal Trek Ways will receive and transfer you to your designated hotel. The rest of the time can be spent as you please. You have just gotten back from a long trip, so you would probably want to groom yourself and relax. Try out the herbal spa and do away the trekking fatigue. You have an extra day at Kathmandu tomorrow. Overnight at hotel in Kathmandu; breakfast included. This is a free day in Kathmandu to fulfill anything that you missed out spotting in this energetic capital of Nepal. You can indulge yourself in shopping or strolling around some of the cultural and historical landmarks of Kathmandu. Thamel is your hot spot for shopping where you can haul all the souvenirs representing Nepal and its culture. May be that in addition to your interesting trip anecdotes, you would also want to take back some stuff for your friends and relatives. In the evening, a farewell dinner with a range of traditional Nepali cuisines, will be hosted by Nepal Trek Ways. Enjoy the dinner, pack/prepare yourself for a flight back home and have a beauty sleep. Overnight at hotel in Kathmandu; breakfast and dinner included. Dolpo is a far-flung and mystique gem of Nepal. Bound to the east and south by the towering Dhaulagiri and Churey ranges respectively, this secluded corner of Nepal was derestricted for international tourist access only in 1989. 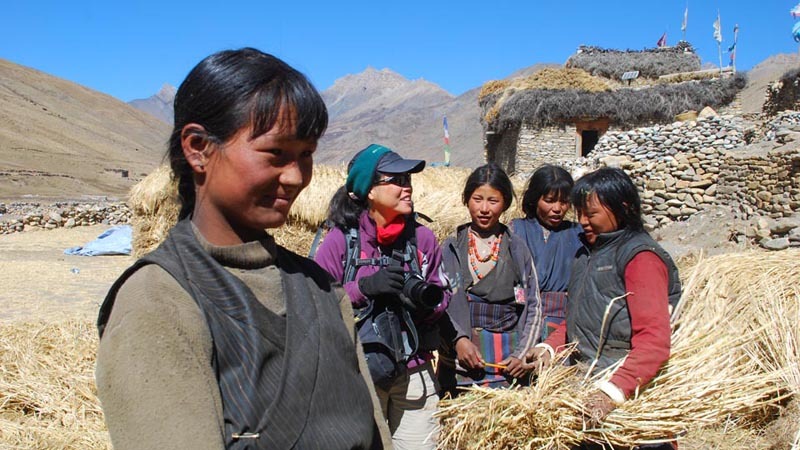 Upper Dolpo Trek features trekking along the ancient salt trading route to Tibet. The trek follows off-the beaten- track leading into remote Buddhist settlement, tranquil Say Phoksundo Lake, exotic landscape, Api Saipal and Kanjiroba Himalayas etc.